I had the chance to see The Miracle Season a few days before it opened and I wasn’t prepared. So I’m here to prepare you….bring all the tissues you can fit in your pockets! You’re gonna need them! 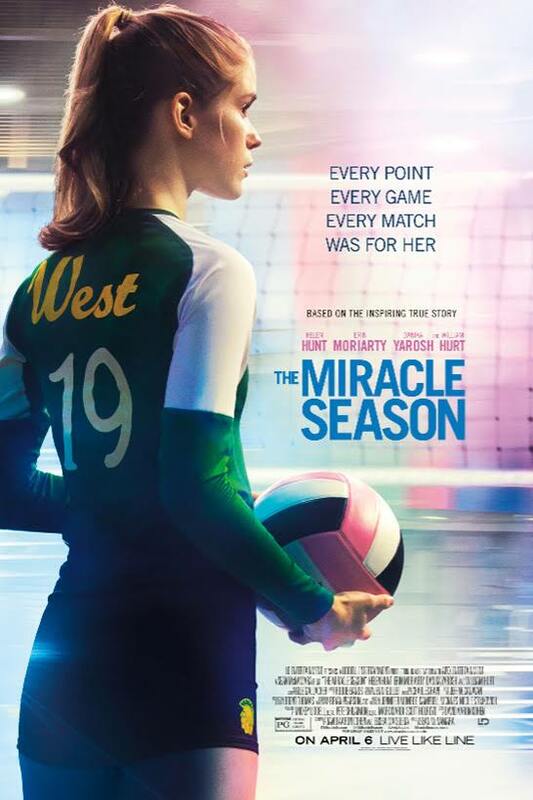 The movie The Miracle Season is the true story of Caroline “Line” Found, he star player and captain of the volleyball team at West High School in Iowa City, Iowa. After her tragic death at the beginning of her senior year of high school, her teammates and coach band together to try to win the state championship. The movie stars Helen Hunt, William Hurt, and Erin Moriarty. This movie will bring you to tears and laughter over and over again as the team and community tries to move on after Line’s death. It was such an inspirational story filled with great messages, faith, heartache, love, and the importance of teamwork. I do wish that there was more actual volleyball playing instead of some quick montage of games that quickly go by on the screen, but the game that counts, the championship game, is exciting and almost worth the wait for some volleyball action. I took my 13 year old daughter to the movie with me and she really enjoyed it. She cried (which is very unusual for her) and said it was a very emotional (but good) movie. I’m not sure younger children would enjoy the movie, but as always know you children. There isn’t really anything else wrong with the movie that would make it inappropriate for younger kids except the fact that the movie deals with death several times throughout the movie. There were extras during the credits. The Miracle Season opens nationwide Friday (4/6/18). Disclaimer: I attended a media screening of this movie.